3. You will now have the “Create a New Account” screen. Fill in the required information. Ensure you follow the standards for the password. 4. To properly fill in the account info, you will need to enter the text in the “reCAPTCHA” section exactly as shown. There will be two images, ensure you place a space in between the entered text for each image. Then click on “Create my new account”. 5. 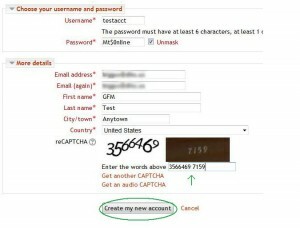 You will then be sent a confirmation email to the email address you provided in steps 3 and 4. The email should arrive within 5 minutes but sometimes can take up to an hour. 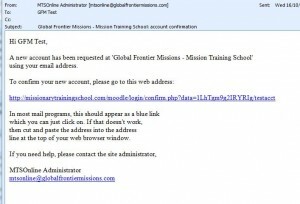 If you do not see the email, please check your spam folders/filters. 6. The email will look like this. Click on the link provided or copy/paste it into your web browser. 7. You will arrive at a screen like this. Your account has now been confirmed! 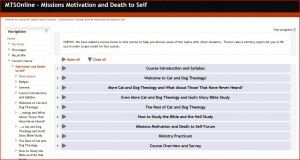 Click on the “Courses” button to continue enrolling in your preferred course. 8. 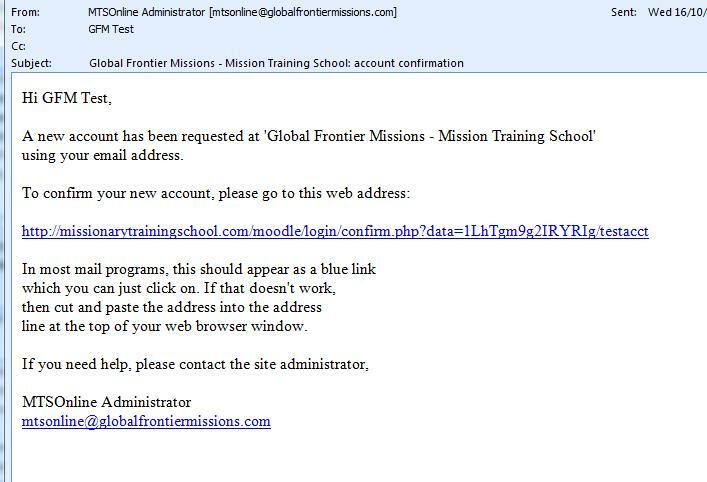 Click on the “Global Frontier Missions – Online Mission Training School” link as shown in the screen shot. 9. 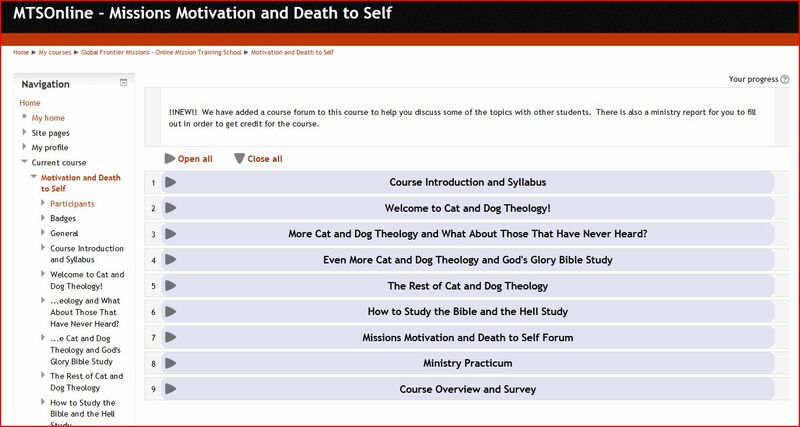 Now click on the course you would like to enroll in. At the moment you will only have the option for “MTSOnline – Missions Motivation and Death to Self”. 10. 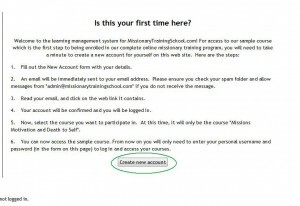 Click on the “Enroll Me” button in the next screen. 11. Congratulations! 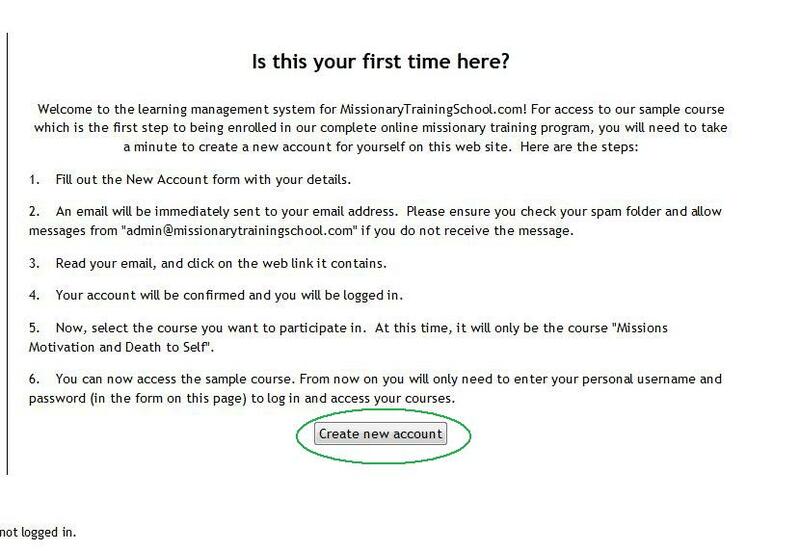 You have successfully enrolled in an MTSOnline course. Get started and enjoy!